This is NOT a “he’s sick, get him to sign while you can.” Instead, it’s a plea for help. Get an extra Starrette card. Print an extra custom. Then, use a post-it note. Clearly state, “FOR YOU” on the gift. Please, don’t hint or generalize in the letter that he can keep some if he wants. Make the gift specific. Imagine a caring medical staff, often taken for granted, displaying their Starrette autographs like badges of honor, awards they earned. 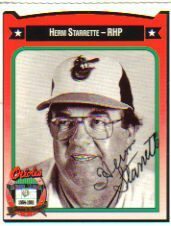 As long as he’s able, Starrette is sending notes with his autograph replies, including memories, or thanks for the extra cards. He’s a grateful gentleman who’s never forgotten us fans. Let’s do the same. Remember him as a 1960s Orioles hurler, the pitching coach for the 1980 World Champion Phillies or a chief ally for Red Sox GM Dan Duquette. Just remember Starrette, while there’s still time. Meanwhile, enjoy this 2010 newspaper feature interview with Starrette. Coming Thursday: Gary Pressy, a musical tradition for the Chicago Cubs.